There are many ways that a vehicle will inform its driver that there is a problem occurring under the hood or elsewhere within the vehicle. Strange smells, odd vibrations and dashboard warning lights are all common symptoms of general car trouble. Another frequent indicator of a problem is a weird noise. The following are a few of the most common car issues that can be diagnosed by the sounds they cause! If you ever hear something weird be sure to visit your local auto shop for further diagnostics. 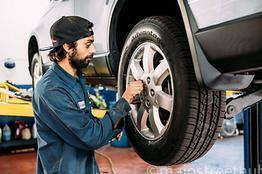 Should you encounter a grinding or squealing noise when you hit the brakes it is imperative that you head to the auto shop immediately. The sound that you're hearing is a sign that the brake pads have worn thin and metal is grinding on metal. Replacing the pads will erase the sound and restore the safety of your vehicle. A grinding sound that occurs when the transmission shifts, either in an automatic or manual transmission vehicle, is a sure sign of a problem. The most simple issue would be low transmission fluid levels, as this increases friction in the gearbox. Left unchecked this will lead to many other problems that can result in a need for major transmission repairs. The engine bearings will create a knocking noise that rises and falls in repetition with the engine RPMs if they are wearing out. It's important to let a mechanic handle this issue as soon as possible because these bearings support the motion of the moving engine parts. If the bearings aren't serviced the motor could seize. If you turn the key and the engine doesn't start and you instead hear a loud click or a series of clicks it is probable that the starter motor has failed. This is the sound of the starter actuating its pinion gear but not spinning the engine. An increase in the volume of a vehicle's engine is a common sign of an exhaust leak. Aside from routing hazardous exhaust fumes past the passenger cabin and converting them to less harmful emissions the exhaust system also dampens engine noise. automotive diagnostics in Palo Alto head to The Car Doctor. Our auto repair team will get to the bottom of whatever noise you're hearing and make it go away! Give us a call at (650) 492-6853 to request an appointment for quality auto repair in Palo Alto today.